Welcome the central hub of Onward State’s coverage of THON 2018. Follow along here for updates, pictures, videos, and more from the 46th annual Penn State IFC/Panhellenic Dance Marathon. 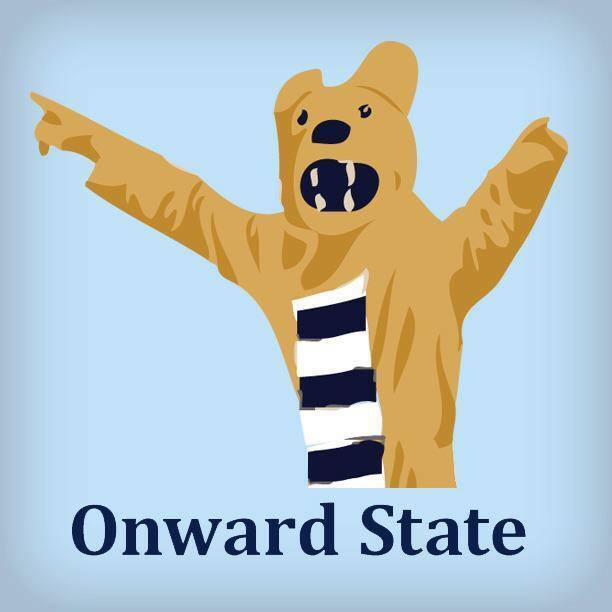 Be sure to follow @THONwardState, @OnwardState, and our Facebook Page for up-to-the-second coverage of everything going on inside the Bryce Jordan Center all weekend long. 4:17 p.m. Howdy, folks. Your 2018 THON total is $10,151,663.93!!! 4:00 pm 3, 2, 1…DANCERS, SIT. 3:50 p.m. Do y’all have one more Line Dance left in you? 3:47 p.m. Diamonds go up. Go Go Gadjet goes out. 3:37 p.m. You’d never know it’s a Sunday afternoon. Sure, dancing with somebody who loves you is cool, but have you ever danced for 46 hours with 15,000 people that love what you love? Go Go Gadjet is looking for the #DabCount. Dab on 'em, BJC! 3:33 p.m. ALL HAIL BABY TRUMPET. 3:30 p.m. In a half hour, we’ll be singing “I don’t dance now and mean it.” Someone get Marcus Allen out here to make money moves. 3:26 p.m. Eleven THONs with Go Go Gadjet. That’s almost as many points as Rutgers has scored against Penn State since joining the Big Ten! 3:23 p.m. “Soulja Boy” to “Say My Name,” what is with all these bands jumping all the over place?! 3:21 p.m. Yeah, the answer is no. 3:20 p.m. DANCING IN FEBRUARY! Is there any better way to cap off a Penn State mega party than Earth, Wind, and Fire? 3:07 p.m. Go Go Gadjet has taken over the building, the lights are dimmed, and the THON-branded light sticks are in the air. Looks like Hour 46 to me. FTK! Put your diamonds up! 3:06 p.m. It’s “Zombie Nation” time, baby! 2:47 p.m. And the 45th Line Dance of the weekend is hyping up the crowd with just over an hour left. 2:43 p.m. The transition from “Somewhere Over the Rainbow” to “Love in a Hopeless Place” is certainly something. The letters are back up, the buzz has returned to the formerly quiet and somber crowd, and the BJC is once again rockin’. 2:41 p.m. “Somewhere Over the Rainbow” has now begun playing throughout the BJC, as those in attendance and on the floor begin hugging after an emotional hour and forty minutes. 2:16 p.m. The Celebration of Life video has begun in memory of the brave children who have passed away far too soon. "It's not goodbye, it's see you later." 2:10 p.m. After Rose began high school, she and Hope began to grew apart, until she received a call from Hope’s mother, who said that Hope probably only had one or two more weeks to live. Hope outlasted the doctors’ expectations by three months. That Christmas, Rose learned that Hope had been admitted to the hospital the night before, and that she would have to go say goodbye to her best friend. "Instead of opening gifts [Christmas] morning, I spent an hour saying goodbye to my best friend." 2:07 p.m. Hope’s best friend Rose has taken the stage. She lived next door to the Maldonados and is recalling how she dealt with supporting her friend through the hardest days of their lives. Hope's best friend is telling the story of when she learned her best friend was diagnosed with cancer. "I didn't know how to act around her at first," she said. Hope, a member of the swim team, won a swim meet the day after she had chemotherapy. Mrs. Maldonado said the doctors and nurses at the Hershey Medical Center were always bragging about Hope. "[Hope] didn't let the cancer and chemo stop her. She just kept living her life as best as she could." 2:00 p.m. Hope Maldonado’s family has taken the stage, after the entire BJC erupted in the impassioned, upbeat applause it receives every year. 1:44 p.m. We’ve taken a break from family stories to watch the “Where Are They Now?” video that gives an update on THON children who have beaten cancer. 1:43 p.m. We think Landon has a future in the Nittany Lion student section after that “We Are” cheer. "We are grateful and humbled by all who have been part of THON," Mr. Kreider said. 1:37 p.m. Landon went through more than three years of chemo, before being declared cancer-free in December 2015. "Learning about the Four Diamonds and THON brought us a glimpse of hope," Landon's father says. 1:35 p.m. Landon began showing strange symptoms with bloody gums, when he was five years old. After first visiting the pediatrician and then being directed the oncologist, the Kreiders received Landon’s diagnosis. 1:34 p.m. Landon Kreider’s family has taken the stage. 1:33 p.m. The Knepp family signs off with an emphatic “We Are” from Landon. "YOU are the biggest blessings in our lives, and we cannot thank you enough!" 1:30 p.m. Mike Gesicki has been an important part of Landon’s fight. His girlfriend Halle Proper FaceTimed him this weekend, so Landon could see No. 88 during THON. 1:27 p.m. Knepp recalls the support her family has received from its orgs. 1:23 p.m. “Give it up for the nurses and doctors at Penn State Hershey.” Katie Knepp explains the impact that the staff at the hospital had on her family’s well-being during Landon’s treatment. 1:19 p.m. Now that the family procession is complete. Landon Knepp’s family will its story. 1:06 p.m. The family procession has begun, as each org gives its THON child’s family a powerful roar of support. 1:03 p.m. Welcome to Family Hour. Family Relations Tommy Misiak kicks it off with an introduction for the most emotional hour of the weekend. 12:47 p.m. And, finally, here we go with one even the freshmen will know. 12:41 p.m. Just a year ago, we were singing about Pokemon GO! and wondering WHY IS EVERYTHING SO LIT?! 12:38 p.m. Get ready to Ignite, Electrify, and Show your pride. 12:35 p.m. BLAST OFF BJC! Say hello to the 2016 DR captains. We look back on the debut of the “We Are” sign, Penn State hockey’s first Division I-ranking, and the beautiful day that Sheetz opened on Pugh Street. Oh yeah, and LATE DROP! 12:23 p.m. The 2013 and 2014 Morale captains are bringing back memories of the Catch and a simpler time. 2014 Line Dance: Buzzfeed taking up our time / Have 6 seconds? Make a Vine! 12:16 p.m. The 2013 Morale captains are stomping and making the stands shake! There was a time not too long ago when winning a football game in overtime was monumental enough to be in the Line Dance. Imagine that. 12:05 p.m. The Bucks County Bungee Jumpers are back on the stage and just drew a roar from the entire arena (and press row, we’re big fans). 11:59 a.m. After The Rockets gave us one of the most electric performances of the weekend and one that literally had something for everything, we’ve reached the Final Four. 11:51 a.m. Now the entire BJC is lost in a Grease medley, and the all-male The Rockets are all wearing T-Birds and Pink Ladies jackets. 11:46 a.m. “Hakuna Matata” really doesn’t work as headbanger rock. We always pictured of it as a laid-back stoner anthem. 11:41 a.m. No remix will ever outdo the Lion King Trap Remix, but this Disney movies rock cover is a BANGER. We always knew Ariel was a rebel, but that rendition just made King Triton ground her for the next three weeks. 11:38 a.m. We’ve seen a lot of rock and roll covers of “Gold Digger.” This is by the far the wildest. 11:36 a.m. Aaaaand another E-A-G-L-E-S cheer. 11:35 a.m. The Rockets managed to work the classic Penn State “Whooooooooooooooah” from “Seven Nation Army” into “Shout.” THAT is how you make the Bryce Jordan Center erupt. 11:22 a.m. We’ve seen a lot of bands play a little bit of everything, but The Rockets jumping from era-to-era and genre-to-genre quicker than anyone we’ve seen this weekend (or ever). This performance is for all those without enough conviction to commit to saying he or she likes a specific type of music, aka Anthony Colucci. The Rockets have us rockin' along to "Before He Cheats" and "Man, I Feel Like A Woman." 11:18 a.m. The Rockets are bringing the heat with “Before He Cheats.” You can feel all the angry ex-girlfriends in the house’s emotion and frustration in the sing-a-long. The Rockets saw the #DabCount on Twitter, and gets everyone in the BJC to dab. Good luck keeping track up there, guys! 11:15 a.m. These students better start tallying up all those dabs. 11:09 a.m. From “Mr. Brightside,” to “Dynamite,” to Timber.” Shore Shore. 11:06 a.m. Another band, another cover of “Mr. Brightside.” The Rockets, not The Killers are coming out of their cages at the BJC. We really can’t blame all these bands for covering objectively one of the top-six songs of all time. The song is a staple in the UK’s top charts. 10:49 a.m. President Eric Barron is on stage to thank us all for our annual fundraising efforts. "Everybody is copying you. There are many "thons" but there is not thon like the Penn State THON," says President Barron. 10:40 a.m. DANCER RELATIONS CAPTAINS TO THE STAGE! 10:31 a.m. Sky Katz from the Disney original series Raven’s Home hits the stage hard, rapping to some Nicki Minaj to get the BJC bumping. 10:22 a.m. Seats in the THON family section are beginning to fill, as we inch closer and closer to the Final Four. 10:12 a.m. Dancer relations captains to the stage! There are only five line dances left after this one. 9:58 a.m. It’s time for the final installment of the crowd game finish that lyric! Audience members finished the lyrics to the Fresh Prince of Bel Air theme, “Ain’t No Mountain High Enough,” and “ABC.” A pretty easy lineup to conclude the crowd game. 9:42 a.m. The red car wins the fifth BJC car race! We’re not sure if this is the final installment of the event, but if so then the red car just secured a 3-2 series victory. 9:30 a.m. While the floors get cleaned, the crowd is getting in on some trivia action. This round of trivia consists of naming the celebrity based on a childhood picture, but it’s not as easy as it sounds. 9:26 a.m. This SpongeBob clip can only mean one thing: it’s mopping time! 9:18 a.m. Time for another dance group! This time it’s Penn State’s Lyrical Line (PLL) Dance Company. 9:16 a.m. It’s time for a water social! Fittingly, “Thunderstruck” plays in the background as dancers chug to stay hydrated. 9:13 a.m. Purple won this year’s Color War, and decided to eliminate orange from next year’s competition (because nothing rhymes with it, probably). 9:06 a.m. Time for the line dance to get this crowd moving as it nears capacity. 8:55 a.m. PFC has decided to conclude its set by leading the BJC in singing the Titanic theme song. This HAS to be a first, but is it a world record? 8:49 a.m. Piano Fight Club’s rendition of “You’re Welcome” from the Disney movie Moana is a huge hit with the BJC Sunday morning crowd. 8:46 a.m. You can normally catch Piano Fight Club on Wednesdays at the Phyrst, and they do take requests…even before their THON performance, apparently. 8:39 a.m. The duo is called The Piano Fight Club, which sounds cool as heck. 8:31 a.m. There are two keyboardists warming up on stage. Whatever is about to come of this should be good. 8:05 a.m. MKTO’s “Classic” is pumped through the speakers as we move into the final six hours of THON. Lots of pictures are being taken on stage, but not much else going on at the moment. 7:49 a.m. DANCER RELATIONS CAPTAINS, you know what to do. 7:43 a.m. The Brass Cadillacs finish up their set with 4 Non Blonde’s “What’s Up”. We’re one band closer to the THON total reveal. 7:39 a.m. “I’ve got soul but I’m not a soldier” rings out through the BJC. 7:24 a.m. If you all didn’t know by now, Stacy’s mom does ~in fact~ have it going on. 7:05 a.m. After some ska in the form Phish, apparently it’s time for early 2000s power hour from the Brass Cadillacs. 6:43 a.m. The Brass Cadillacs are up on stage, opening their set with “Dirty Little Secret” by the All-American Rejects. Café favorite The Brass Cadillacs is now on stage, opening with a cover of The All-American Rejects' "Dirty Little Secret." 6:03 a.m. SB says he will help put together an all-star matchup of eighth graders coached by Penn State lettermen for a good cause on Blue-White weekend. 5:55 a.m. Our beloved line dance leader is back on stage to lead the “7th Inning Stretch.” You’ll really want to feel it in the back of your legs. 5:49 a.m. “DANCER RELATIONS CAPTAINS, TO THE STAAAAGE!” booms a voice overhead. THON is now. 5:42 a.m. Now, Roar! Brass Ensemble, which was formed in 2015, is taking us down to New Orleans with its performance. Ya like jazz? 5:36 a.m. Penn State’s American Sign Language Association is signing Ben Rector’s “Brand New Good Mood” right before our eyes. 5:30 a.m. Don’t Stop Me Now! Tapestry has taken the spotlight with a dance number opening up with some Queen. 5:25 a.m. Rince na Leon is on stage treating the crowd to some Irish dancing to an Ed Sheeran tune. Nothing makes sense this early in the day, but everything makes sense. 5:09 a.m. DANCER RELATION CAPTAINS TO THE STAGE!!! 5:06 a.m. Water Social! Gotta stay hydrated! 5:03 a.m. The 2018 THON Prop Bets are live and it’s time to make your picks! 4:54 a.m. One, two, three, four, five. 4:50 a.m. Penn State’s Bounce becomes THON’s first Chinese dance team to perform. 4:46 a.m. Another dance group has taken the stage. 4:18 a.m. DANCER RELATION CAPTAINS TO THE STAGE!!! 4:14 a.m. Penn State’s Indian classic dance team, Natya, is on stage wowing the dancers with some dance moves of their own. 3:55 a.m. It’s time for Slides of Strength! 3:49 a.m. OH MY LAWD! In the fourth car race of THON 2018, the Red Car is first to the finish! We’re now tied 2-2 on the car races with no sign of stopping any time soon. 3:23 a.m. DANCER RELATIONS CAPTAINS TO THE STAGE! It’s time for another iteration of everyone’s favorite dance routine. 3:03 a.m. It seems like Burn Unit has literally been on stage for an eon, but most of the crowd looks engaged, so whatever they’re doing is clearly working! 2:42 a.m. I’d like to apologize for roasting the THON cover bands, as Burn Unit is actually impressing us here on Press Row. If you’re a cover band, the key is in the set list, and this group sure has theirs down to a science. Maybe people or hype or maybe they’re just starting to feel like jello, but either way, things are going well. 2:19 a.m. This is the part of THON where things slow down and dancers start to struggle a bit leading into Sunday morning. Here are our tips for staying awake (and alive). 1:56 a.m. DANCER RELATIONS CAPTAINS TO THE STAGE! Has it really been that long already? 1:49 a.m. We missed a performance (sorry, folks) but now Penn State ballet group Volé is on stage with ANOTHER performance to a song from The Greatest Showman. The soundtrack to this movie really is phenomenal, y’all. 1:32 a.m. Next up on stage is Chinese group ACE Dance Crew, clad in red and white and kicking things off to a version of “If You’re Happy and You Know It.” Things quickly took a turn for hip hop, but everyone’s a kid during THON. 1:27 a.m. We’re rocking out here at the BJC to a dance performance by Island Fever. I personally can’t get enough of these dance moves, and the music is just what the crowd needs right now. 1:15 a.m. DANCER RELATIONS CAPTAINS TO THE STAGE! 1:12 a.m. Chug, baby, chug! There’s no better motivation to stay hydrated than a dozen THON volunteers on the stage telling everyone to drink. 1:04 a.m. THON’s Crowd Entertainment folks are really stepping up their game this year. It’s time for “Finish The Lyrics” crowd version. This segment used “Breakin’ Free” from High School Musical, “Wagon Wheel,” and Avril Lavigne’s “Sk8er Boi” and the crowd contestants were shockingly accurate. 12:58 a.m. AND THE BLUE CAR RETURNS FOR ANOTHER VICTORY! THON’s car racing record is now 2-1 in favor of the Blue Car, which may as well call Section 114 home. Better luck next time, Red Car. 12:40 a.m. We’ll never know what else people put on the grill or what other shoe brands Penn Staters wear. THON Family Feud: It’s no Steve Harvey. 12:35 a.m. IT’S HAPPENING, FOLKS! OPP is mopping the floor yet again. Oh, and Crowd Entertainment Family Feud. Whatever floats your boat. 12:22 a.m. Morale is…morale…at THON right now. If you’re ballin’ to pass the time, check out the BJC’s mystery basketball hoop. 12:14 a.m. DANCER RELATIONS CAPTAINS, TO THE STAGE! 12 a.m. Welcome to THON Day 3! What better way to ring in the final day of THON 2018 than with a little country music? Happy day that may or may not be Sunday, folks! 11:56 p.m. Wagon Wheel is a bright spot in this otherwise painful performance. We don’t know what’s happening, either. 11:50 p.m. Yep, this is still going on. Unlike the crowd that gathers for most bands performing at the BJC, there’s not much going on for these guys. 11:26 p.m. Is Lynyrd Skynyrd country? I’ve never really been sure. Anyway, here’s Sweet Home Alabama. 11:23 p.m. It’s been made abundantly clear that much of the BJC is resistant to country music, but here we are nonetheless. Mountain Road is on stage now. 11:05 p.m. Thespians closes their set with a number of songs from new movie The Greatest Showman. 11 p.m. Donation crediting is officially over! From here on out, all donations made to THON will be counted toward the final total, but can’t be credited to any specific organization. 10:49 p.m. Always a highlight of THON Weekend, the Bucks County Bungee Jumpers jump rope squad takes a quick selfie before heading off stage. We still can’t believe what these girls can do! 10:44 p.m. Everyone’s favorite jumpers are on stage now! There’s nothing like small children jumpig tope to get the Bryce Jordan Center on its feet. 10:33 p.m. DANCER RELATIONS CAPTAINS TO THE STAGE! 10:13 p.m. My Hero Zero honestly just never tires. Jason O makes the BJC want to shout before heading into some Penn State fight songs on the trumpet. LET’S! GO! P-S-U! 9:59 p.m. This is Jason O’s house and everyone knows it. 9:46 p.m. Like all the other cover bands we’ve seen this weekend, My Hero Zero is pumping up the crowd with some favorites, like “24K Magic” by Bruno Mars. They’re loud, but I still have eardrums. 9:35 p.m. State College favorite My Hero Zero is up next to entertain the crowd at THON 2018! Starting with a Gavin Degraw classic, we don’t want MHZ to be anything other than them either. 9:01 p.m. DANCER RELATIONS CAPTAINS TO THE STAGE! 8:55 p.m. That’s all for the pep rally! And now, back to your regularly-scheduled programming. 8:52 p.m. Glorious and victorious, it’s time for the Penn State Alma Mater. Oh, hi, Paul Clifford! Paul’s the CEO of the Penn State Alumni Association. RAISE THE SONG! If you somehow still don’t know the lyrics, they’re now posted along top of the lower bowl at the Bryce Jordan Center, but most of the sections are covered up by spectators. 8:51 p.m. AND YOUR THON 2018 PEP RALLY WINNER IS…MEN’S GYMNASTICS!!! 8:48 p.m. Representing Philadelphia will be men’s gymnastics! The crowd can’t wait to see this one again. If you think the squad gave it their all the first time around, you were unfortunately mistaken. YOU CAN’T STOP THEIR SHINE BECAUSE THEY’RE RIDIN’ SOLO! This team’s a clear crowd favorite and there’s no doubt about it. 8:46 p.m. Representing Pittsburgh will be men’s golf! Cult classic “Jesse’s Girl” is a real crowd-pleaser tonight at the Bryce Jordan Center, followed up by a stunt-laden “Mr. Steal Your Girl” before we all fell apart along with the squad. 8:44 p.m. On stage now are the Penn State majorettes. Unlike Rachel Reiss, these ladies haven’t been awake for an ungodly amount of time. We wouldn’t even have blamed her if she dropped her baton (she didn’t). 8:41 p.m. Blue Sapphire Rachel Reiss is dancing in THON and now she’s twirling on stage. Is there anything this girl can’t do? 8:36 p.m. This is a better wave than any I’ve seen in Beaver Stadium — sort of eliminates the “Student Section Effect” and makes the wave strong for the entire go-around. Either way, WE ARE PENN STATE! 8:34 p.m. DEFENDING CHAMPIONS MEN’S GYMNASTICS IS IN THE HOUSE! The room falls silent as they set up their routine, then quickly bounces into an incredible routine starting with “Ridin’ Solo.” YOU CAN’T SEE THIS ANYWHERE ELSE, FOLKS! These guys are Fergalicious and they aren’t afraid to say so. They’re PUMPING IT with breakdancing and all. There’s absolutely NO REASON these guys shouldn’t take home the title yet again. 8:32 p.m. Women’s hockey has got their gear on stage and they are ready. to. rumble. It’s not about the money, and that’s good, because the NAA isn’t offering any. Making the world dance, on the other hand? That’s something THON can help out with, I think. 8:31 p.m. These men’s swimming and diving team members are taking their skills to land to put on a performance dressed like the greasers we all know and love. Let me tell you, they are shaking that Laffy Taffy like it’s never been shaken before. 8:28 p.m. Women’s soccer is pulling out the denim on denim for this impressive routine. Again, you can’t go wrong with Cardi B especially in combination with Bruno. Hold up, is that a Boombox Guy impersonation? These ladies want to have a good day, and judging by this late-game gymnastics stunt, they might just get their wish. 8:26 p.m. On stage looking dapper as ever is men’s fencing. I had no idea you could get slacks in so many colors. Only a couple of their Thrillers went the wrong way during the routine, so I’d call that a success. My only disappointment from this routine is that we didn’t get to see any moonwalking. 8:24 p.m. Women’s lacrosse is up next, also sporting a black-and-camouflage theme on stage. BEYONCE BABY girls do run the world. Somebody put a ring on these ladies STAT! They’re crazy in love and so am I — with their hair flipping skills. 8:22 p.m. Next up is Penn State football, led prominently by Sean Clifford. Holy [redacted], these boys have got moves. I guess it does take a lot of agility to move around the other players on the field. They are ROCKING their bodies right if I do say so myself. So far, these guys would be my pick for winners of the Pep Rally. It doesn’t get much better than this, folks. 8:21 p.m. WE’VE GOT A FEVER AND THE ONLY CURE IS MORE COWBELL! 8:20 p.m. First on stage for the East side is women’s golf with a country-themed routine. Luke Bryan is performing here at the BJC in just a few days, you know, and these country girls were certainly shaking it. Wait a second, Cruise? Is this Power Remix circa 2016? If so, these ladies are starring in a fitness class. Sure. 8:18 p.m. Who does Sandy Barbour think was the best from the west side? “I love all my children.” We love you too, Sandy Mom. 8:16 p.m. The last time from the west, here we go with women’s gymnastics! Sunglasses are the move, it appears. It’s tricky to rock this rhyme but somehow these ladies are NAILING it anyway. I want to dance with somebody too, and it’s the women’s gymnastics team. They’d have to carry the team, though. But after this performance, it’s certainly nothing they can’t handle. 8:15 p.m. I’ll admit golf isn’t the most dancer-friendly sport, but you wouldn’t know it by checking out this squad’s routine. We’re constantly amazed at how teams improvise when their skit requires a female figure. I’ve seen more dresses on men tonight than I have in quite some time. WHO KNEW GOLFERS COULD DO A BACK FLIP?! This routine was quite the saga. 8:13 p.m. We’re told women’s field hockey was on the stage, but due to what appeared to be a lot of camouflage, it was hard to see them. Even with some back flip gymnastics moves and swimming in a literal see of bodies, these ladies were HUMBLE like Kendrick. 8:11 p.m. Fresh off a victory over Stonybrook, men’s lacrosse shows no sign of stopping its winning streak now. Though slightly more shy than men’s soccer, lacrosse left still plenty of views to be had and hearts automatically melt to any Justin Bieber lip sync. Do you even LAX, bro? Because we do. 8:10 p.m. “What’s better than doing 46 one-armed pus-ups For The Kids?” Nothing. Not. One. Thing. 8:08 p.m. Women’s rugby don’t play. After what appeared to be some technical difficulties, they went full Fergie and got it STARTED in here. The first to pull out the Backstreet Boys card, these other teams can say “Bye Bye Bye” to a winning performance after women’s rugby literally flipped on stage. AND WITH LIPGLOSS! They’re poppin’. 8:05 p.m. Tennis players are agile folks, apparently. Men’s tennis is on stage now and OH OKAY just stripped into wife beaters and slid on the stage. 8:04 p.m. Did I mention P.J. Mullen is wearing his Dance With Us shirt? He’s #Climbing always. 8:04 p.m. We heard a rumor that Penn State’s fencing team like to fence, and to be frank, we were shocked. Tonight’ they’re superheroes in their own rite — even without the daggers. Spice Girls can never disappoint a crowd. It’s a proven fact. When you follow it up with “Finesse” by Bruno Mars ft. Cardi B, this is a competitive set list if I’ve ever seen one. BOOGIE NIGHTS! Full hearts, something something, can’t lose. 8:03 p.m. Men’s soccer is on stage wearing shirts that look like they’re ready to be ripped off at any moment. UPDATE: They just ripped their pants off. THIS IS NOT A DRILL, PEOPLE. They might not be the most coordinated, but they’re #FTK and they’re not shy about shaking it. UPDATE: The shirts are now ripped open in the front, and one teammate is the female figure in this routine. Wow, that’s a lot of abs. 8:01 p.m. The show goes on first with women’s volleyball. Can you dig it? We certainly can, as an all-black clad squad showcases that maybe they should really be on the gymnastics team. Were these bumpers, setters, and spikers cheerleaders or dancers in a past life? Russ Rose should be proud. 8 p.m. As P.J. said it best, LET’S GET THIS PARTY STARTED! Tonight it’s a battle of East and West: Pittsburgh teams vs. Philly teams, as announced by Sandy Barbour. 7:59 p.m. We’ve got pros in the house! Also judging tonight are Penn State football players-turned-pros Anthony Zettel, Jesse James, and Stefen Wisniewski. No event is complete without another Eagles chant. 7:53 p.m. P.J. Mullen will host tonight’s pep rally inside the Bryce Jordan Center. You might know him better as the Beaver Stadium Music Man, but he wears a lot of hats around here. Tonight’s judges: Miss Pennsylvania Katie Schrekengast, Blue Sapphire Rachel Reiss, Penn State Athletic Director Sandy Barbour. 7:52 p.m. This year’s Pep Rally is a lip sync battle. It’s a good thing student-athletes got some practice at their own THON fundraiser through the Student Athlete Advisory Board. 7:47 p.m. If you don’t like the Lionettes, we don’t like you. While it may not be the most purely entertaining, this is probably the most impressive and highly-skilled performance we’ll see all night. Also, Najah Brown is a queen. 7:44 p.m. We wanted the lion and now we’ve got him! No one gets a crowd of Penn Staters pumped up quite like the symbol of our best. 7:33 p.m. Lion King Trap Remix is on at the BJC and no one is dabbing when the beat drops. We’re feeling some type of way about this. But more importantly, IT’S PEP RALLY TIME, BABY! 7:22 p.m. DANCER RELATIONS CAPTAINS TO THE STAGE! As if we’d have it any other way. 7:17 p.m. We’re “Livin’ On A Prayer” here in the BJC as the bowl fills up in anticipation of tonight’s Pep Rally. Up next to the stage is Natasha Bigler, singing Bon Jovi in memory of her sister. 7:11 p.m. You just can’t go wrong with MC Hammer. 7:09 p.m. This isn’t the first Eagles moment of the weekend, and we’re willing to bet it won’t be the last. E-A-G-L-E-S- Eagles! 7:02 p.m. Song selection is everything. 6:59 p.m. Paula gave the Bryce Jordan Center a taste of what to expect when Elton John visits this fall. 6:54 p.m. Dressed in a white tuxedo jacket, Jackson Brennan is killing it on the saxophone! 6:51 p.m. Savannah Keenen, we think you would make Grace VanderWaal proud. 6:47 p.m. Ashley Otstott has the full support of “This Town”, aka the City of THON. 6:39 p.m. If Carly “Came Here For Love” she’s definitely receiving it from the crowd. 6:34 p.m. Was Landon Knepp even born when “Yeah” by Usher came out? Who cares! He’s great! 6:29 p.m. Dylan Moser sings “One Foot” by Walk the Moon and the crowd erupts. 6:26 p.m. Orgs can be heard chanting throughout the BJC between performers. 6:22 p.m. Kaitlyn Good is next up, singing with a band of Ohana dancers behind her. The BJC erupts in a sea of lights, cheering Kaitlyn on. 6:06 p.m. THON 2018 presents the Kids Talent Show, starting with a number written by Four Diamonds families: Dance, Dance, Dance. 5:51 p.m. It’s that time! Dancer Relations Committee, to the stage. 5:49 p.m. Our ears are ringing on press row. Is it just hour 24 setting in, or is this the loudest performance of the weekend? 5:31 p.m. The Red Hotts are not the first cover band to play Bruno Mars’ “Locked out of Heaven” this weekend. 5:27 p.m. The Bryce Jordan Center has officially reached capacity ahead of tonight’s pep rally! 5:17 p.m. Covering “I wanna dance with somebody” seems appropriate. “I wanna dance with somebody” or with 15,000+ friends who are all here #FTK. 5:07 p.m. Mr. Brightside has entered the building. 4:49 p.m. Deleware based band ‘The Red Hotts’ kicks off its performance with a song we’ve heard all to often this weekend, Party in the USA. The BJC is rockin’. 4:48 p.m. Snack time in the BJC. The dancers are eating healthy on this break. 4:41 p.m. Disney Princesses will begin walking around the floor. Everyone is encouraged to find their moment of magic! 4:30 p.m. CEO of the Penn State Alumni association, Paul Clifford, says he’s inspired by THON and tells the BJC that every 4 out of 5 children beat cancer because of the work we do here. He reminds us that we must not stop until that number is 5 out of 5. 4:25 p.m. The wave has broken out in the BJC. It made it around two full loops before dying out. 4:16 p.m. U.S. Senator Bob Casey is on stage briefly to thank the dancers for all their efforts this weekend and encourages them to keep it up! 4:11 p.m. And again! Dancer Relations Captains, to the stage! 3:54 p.m. Dancer shoutouts are up on the big screen encouraging dancers to keep moving. It’s all for the kids, folks! 3:41 p.m. It appears as if we’ve transported to Neverland. Captain Hook tells the audience to light the way through the human tunnel for the Kids Mail Call. 3:26 p.m. Time for another water social as ACDC’s Thunder blares in the background and dancers chug H2O. 3:19 p.m. Taylor finishes his performance with an original song to be released in March. 3:15 p.m. James McCoy Taylor has the BJC rocking. Performing covers of favorite childhood artists like Taylor Swift and Backstreet Boys. 3:08 p.m. Former Bachelorette Contestant turned country artist, James McCoy Taylor takes the THON stage and kicks off his performance with the ‘We Are’ chant. “I’ve never been to State College. I’ve always wanted to do this,” Taylor said. 2:59 p.m. Dancer. Relations. Captains. To. The. Stage! 2:53 p.m. We’re on for another round of finish that lyric. Contestants from the College of Earth and Mineral sciences, Alpha Xi Delta sorority, and Delta Gamma sorority all nail the lyrics to crowd favorites, including Party in the USA by Miley Cyrus. 2:39 p.m. Another car race captivates the crowd as the same side of the BJC wins yet again, but this time with the blue car. 2:26 p.m. Family Feud, Penn State style is now on the menu. What are the most popular foods at Beaver Stadium? Apparently chicken baskets, fries, pizza cones, nachos, and pretzels in that order. If only Steve Harvey were here. 2:19 p.m. The Nittany Lion is out on the stage mopping up with some THON crew members. 2:14 p.m. It’s time for some trivia here at THON. The first question, “Where did Joe Paterno go to college?” The answer – Brown. Our couch was very well educated. 2:02 p.m. The Urban Dance Troupe took the stage following the line dance, pumping up the crowd with an impressive performance to some classic hip-hop tracks like “Yeah!” and “Right Thurr.” It turned out to be easily one of the highlight performances of the afternoon, as the combination of music selection and obvious talent was a real crowd pleaser. 1:55 p.m. Dancer RELATIONS CAPTAINS to the STAGE! 1:35 p.m. Hair donation is just nearly underway, but the Creasy family is sharing its story first. The hair donations for to Wigs For Kids, which is an organization that provides custom-made wigs to children free of charge. Logan Knaper, Ben Savino, Sara Rotthoff, Sydney Burke, and Rilynn Junkin – who are all children – donated their hair to the cause. Many rounds of Penn State have come up to the stage to do the same. 1:27 p.m. Dancer Relations captains, YOU KNOW WHERE TO GO! 1:19 p.m. Unfortunately for any rebel scum, the imperials have landed in State College and invaded the BJC. 1:17 p.m. Following Riley Roth’s acoustic set, the THON Showcase “Hidden Wonders” winner Shawn Fox from Phi Gamma Nu performed along with his brother. They stuck with the acoustic medley theme, playing “Semi-Charmed Life” and then moving into a few interesting directions. 1:06 p.m. Riley Roth, a singer-songwriter with smooth sound, has assumed the position in the middle of the stage with her guitar and an accompanying cajon player. She is ready to perform an acoustic set as we move into the afternoon and the electricity builds in here. Roth writes her own songs and lives in Nashville. 12:58 p.m. The Show Twirlers are next up in the line of entertainment, as this young group based out of Altoona remind us of just one aspect of football season that we all miss. An extremely impressive group display and nice solo effort had the BJC impressed. 12:51 p.m. Apparently Slides of Strength wasn’t the only thing going, as Penn State Taekwondo took the stage to give a performance that you quite literally wouldn’t want to get in the way of. Bodies are flying across the stages as wooden board are breaking easily as kicks and flying hands obliterate those poor planks. Slides of Strength is going down. We're yelling TIMBERRR. 12:39 p.m. Guess who’s heading to the stage…DANCER RELATIONS CAPTAINS! 12:08 p.m. The 2018 fashion show – the moment we’ve all been waiting for – has made its way to the center stage. A group of highly fashionable kids are showing off their impressive fashion and spreading their infectious energy. Oh, we can’t forget to mention that they threw up a whole bunch of dabs. 11:49 a.m. Noteworthy: “Stayin’ Alive” by the Bee Gees is being pumped through the speakers in the BJC. We’ve officially entered into a deeper level of THON. 11:43 a.m. Ram has taken over the dancing floor with a “flashmob”…although it was announced over the PA system, so we’re not sure if it actually counts. 11:35 a.m. Dancer Relations captains to the stage! 11:25 a.m. The next hour of THON will be dedicated to Commonwealth campuses, and Brandywine has been named the winner of the second-ever Commonwealth Challenge. 11:13 a.m. Two Dancer Relations committee members started a water bottle flipping competition on stage as the Color Wars got underway. The purple team took the opening challenge. 10:45 a.m. Finally, Orchesis and Phi Kappa Sigma bring the people what they want and need – some Spongebob content via a mashup of famous moments from the sponge himself. And just to put the icing on top, they hit the crowd with that Spongebob Trap Remix. 10:41 a.m. A dance number from Reve Dance Company, this time inspired by Harry Potter, provides the THON attendees with some entertainment. 10:37 a.m. Theta Chi and Vole take the stage, treating the crowd to a Great Gatsby-inspired dance number. 10:24 a.m. Tally Sepot’s family is now at the mic to present the Tally Sepot Memorial Award. Sepot was a member of the Alpha Chi Omega sorority and passed away in a car accident on a canning trip. Kate Trimble was honored with the award. 10:18 a.m. Courtney O’Bryan’s family has taken the stage to present an award in her honor. O’Bryan was a member of Sigma Delta Tau who passed away after a car crash on a canning trip in 2011. Caroline Lerche was honored with the award. 10:05 a.m. DANCER RELATIONS CAPTAINS TO THE STAGE! 9:50 a.m. Representatives from IFC, Panhellenic Council, and Multicultural Greek Council have taken the stage to explain why they THON. Of course, it’s always #FTK. 9:35 a.m. The “Dab Cam” is making its way through the BJC crowd. Nothing like some wholesome dabbing to get the people going. 9:32 a.m. Farabaugh closes things out with Smashmouth’s “I’m A Believer.” Any song choice from the Shrek soundtrack is a good song choice. 9:18 a.m. Olivia Farabaugh, a former contestant on The Voice and a Central PA native, takes the stage with Penn State alum Travis Aughenbaugh on the cajon to perform an acoustic set. 9:04 a.m. Dancer Relations captains to the stage! The dancers are beginning to recite the line dance with ease. DANCER RELATIONS CAPTAINS, TO THE STAGE! 8:50 a.m. Lenina Crowne closes out an impressive set with “Hey Jude,” along with some “Can’t you see?” and “The Weight” sprinkled in. 8:24 a.m. “Come On Eileen” resonates throughout the BJC, much to the delight of dancing THON attendees on the floor and in the stands. 7:50 a.m. Time to chug, again. This time featuring special guest Mike the Mailman! 7:48 a.m. Speedy delivery! Mike the Mailman is on stage for Package Call 2018. 7:45 a.m. Abby Traxler finishes her set with “Legends” by Kelsea Ballerini. 7:40 a.m. Meanwhile, Tetra is back to its word-play shenanigans. 7:35 a.m. Singer and PA Native Abby Traxler has the crowd on its feet with more morning country tunes. 7:18 a.m. Country singer Ashley Elizabeth is on stage, rocking out to some T-Swift early in the morning. 7:04 a.m. While the figure in the THON 2018 logo is Discovering Tomorrow’s Wonder, we got to thinking: what are other prominent Penn State figures searching for? 6:49 a.m. Dancer Relations captains to the stage! 6:42 a.m. We thought that something has been missing from THON this year. “Closer” just played for the first time. 6:38 a.m. Mopping has entered PHASE THREE! 6:33 a.m. A crowd game of “finish the song lyric” offers a nice change of pace. Although, these spectators shouldn’t quit their day jobs. 6:29 a.m. There’s a car race in the lower bowl! The red car takes the checkered flag in the first ever DayTHONa 500. 6:23 a.m. Go Go Gadget is promising to add to the official THON dab count when it takes the stage during the Final Four on Sunday. 6:19 a.m. The THON Salon is open for business. Dancers can get their hair shampooed in the Massage Hallway. Meanwhile, OPP mopping efforts are entering phase two. 6:17 a.m. The dancers are locked in for all 46 hours on the floor, but some spectators choose to go the distance in the stands. We spoke to one freshman who thinks he has what it takes to achieve the ultimate feat on his feet. 6:08 a.m. It’s THON trivia time on stage. Where’s trivia Steve?! 5:58 a.m. And now, an update from official THON statisticians. 5:52 a.m. You know what time it is! 5:50 a.m. Highlight of THON, so far: the SpongeBob clip they showed to announce the first mop-sesh. 5:47 a.m. THON organizations are dressed to impress this year, as always. 5:45 a.m. The Taylor Tote Band put an exclamation point on its set with a tribute to Whitney Houston’s “I Wanna Dance With Somebody” featuring an incredible guitar solo. Standing ovation! Bravo! 5:30 a.m. Securing a section in the BJC for your organization can feel like the Hunger Games due to THON’s hands-off approach. We asked why the great micromanager, THON, decides remain uninvolved when it comes to this aspect of the weekend. 5:25 a.m. Taylor asked the BJC for some energy for her performance of Beyoncé’s “Love On Top.” Surprisingly, there’s still energy to be found inside of the BJC at five in the morning. 5:10 a.m. On a serious note, Taylor Tote performed a song called “Fighter” that she wrote with a friend and childhood cancer survivor. The song is available on iTunes, and all proceeds go to pediatric cancer research. 5:06 a.m. Taylor Tote (of the Taylor Tote Band), “I, too, am a huge advocate of pediatric cancer.” We don’t think that means what she thinks it means. 4:41 a.m. It’s time for meal three, but there are still some question marks on the menu. 4:36 a.m. If you missed the MisterWives performance yesterday, we’ve got you covered with some highlights. 4:32 a.m. Dancers even got to relive the best day of elementary school gym class. The best part of THON? Everyone gets to be a kid again. 4:28 a.m. It’s line dance time! 4:23 a.m. Here are the best moments from the THON dance floor on Friday. 4:17 a.m. Boulevard, the THON organization with the self-proclaimed most lit letters, expressed discontent for our previous letter ranking. We learned that they started the light-up letter trend in 2013 when we spoke to them about their current letters, which can be seen from space (probably). 4:15 a.m. We caught up with former Dancer Relations committee member and first-time dancer, Victoria Oladipo, to get her thoughts on her new role in THON. 4:05 a.m. We Are…sleep deprived and hungry. Here are our late-night thoughts on some of the BJC’s concessions options. 3:56 a.m. Penn State’s newest hip-hop dance group Outcast (sadly, not OutKast) is on stage next. 3:50 a.m. Dance group Sher Bhangra is on stage turning UP to a Bhangra remix of “Rolex” and the crowd is feeling it, Mr. Krabs. 3:45 a.m. Note: Jeremy Fratoni’s name is on the big screen…did THON get our message? 3:43 a.m. The acoustic cover singer even gave his best attempt at Lil Wayne’s iconic verse. A for effort! 3:42 a.m. THON’s Got Talent winner Jeremy Fratoni is back for round two. This time throwing it back to middle school dances with “Down” by Jay Sean. 3:37 a.m. Press Row still doesn’t know the line dance. Sad! 3:33 a.m. DaNceR RElaTioNs cAptAIns tO tHE sTAgE! 3:30 a.m. It’s “Portal Trash Sweep” time! Thank you, OPP, for keeping THON clean FTK. 3:27 a.m. Pass the 3 a.m. lulls in the BJC by trying to pass this THON History quiz – even though you probably still can’t find the museum. 3:12 a.m. Throw up your diamonds, it’s photo-op time on the Four Diamonds stage. 3:05 a.m. Mmm, the smell of baby powder wafts through the BJC, as the weekend’s first Slides of Strength is in full swing. 3:00 a.m. THON in real life. 2:59 a.m. The food and beverage captain came out to keep us hydrated. Three, two, one, chug! 2:55 a.m. Dancers are moving to the right side of the floor to make way for OPP’s first Slides of Strength. 2:49 a.m. Two in the morning is twice as fun. Dancer Relations captains are on the stage for the second line dance inside the hour. 2:46 a.m. Our THON is great and all, but have you ever thought about the other THONs of the world? 2:40 a.m. The 2013 grad decided to conclude his set with the only thing worse than a mashup: a covered mashup. 2:39 a.m. Dear THON, please put the names of the performers on the big screen. Love, your friends in press row. 2:27 a.m. Solo dancer Julia _______ (we didn’t catch her last name, sorry) is on stage to perform “an interesting dance.” It involves some strange peg contraption, so we’re certainly intrigued. 2:16 a.m. DANCER RELATIONS CAPTAINS TO THE STAGE! 2:14 a.m. That’s all from SouthPaw. If you’re craving more, you can catch more of the cover band at The Phyrst on Friday nights. 2:09 a.m. Update: we all earned a participation trophy, I think. 2:08 a.m. The Nittany Lion is on stage with the band to judge a “singing contest” between the left side of the BJC, the right side, and the dancers in the middle. 2:04 a.m. SouthPaw is letting the crowd take over, singing along to “The Anthem” by Good Charlotte. 2:02 a.m. Breaking news: food and merchandise at the BJC is expensive. We compiled a list of things that vendors have available for anyone trying to THON on a budget. 1:56 a.m. We’re getting another sample of the cover band’s song-writing. Our verdict: pretty good. 1:51 a.m. SouthPaw’s mission is to play songs that other cover bands won’t, so we aren’t listening to the same things over and over again all weekend. Yeah…okay. 1:45 a.m. Hello there, SouthPaw is jamming with some Blink 182. In the meantime, it’s Superhero Hour for the dancers. 1:40 a.m. Looking for the THON History Museum? You may not find it behind the endless line for the water fountain. 1:35 a.m. SouthPaw’s lead singer ditched his guitar due to technical difficulties, but don’t worry he got a new one. We’re back with a song FTL (For The Ladies). 1:25 a.m. The cover band is introducing us to an original piece. We don’t know the words, but it has the crowd on its feet. Daily Mr. Brightside count: 2! 1:12 a.m. One of the hottest bands in the cover band circuit…whatever that is. State College’s own SouthPaw has taken the stage. 12:56 a.m. Made you look. 12:50 a.m. Bennie and the Jets is playing and morale is high for dancers, spectators, and bloggers alike. We have a bubble blowing expert on the floor tonight. 12:42 a.m. Dancer Relations captains report to the stage for the first line dance of Day 2! 12:40 a.m. We went on a quest to find the most lit organization letters of THON 2018. Here are our findings. 12:31 a.m. Martelli concludes his set with a “We Are” chant – as every set should end. 12:27 a.m. The country singer is covering the Backstreet Boys, and the crowd does, in fact, want it that way. 12:22 a.m. Martelli announced he is from Philly, which naturally sparked an E-A-G-L-E-S chant. 12:16 a.m. THON has officially turned into a house party, as Martelli covers Sam Hunt’s country hit. 12:12 a.m. Country singer Lenny Martelli has the BJC rocking to “Sweet Home Alabama” bright and early on day 2. 12:00 a.m. Welcome to THON day 2! 11:56 p.m. 3AM Tokyo brought the action and energy to close out the first day of THON 2018. 11:55 p.m. Waldo Black wraps up his set by taking the first all-THON selfie of the night. Now it’s time for the National Honors Society for Dance Arts to grace the stage with their moves. 11:52 p.m. There are tons of unique letters peppered around the Bryce Jordan Center, but SNAP and DKE created superhero-themed letters for their THON child Lucas who is a massive fan of all superheroes. 11:50 p.m. We’ve received multiple reports that a chain fell from the BJC ceiling and hit a dancer. We’ll update you as we get more information, but here’s what we know now. 11:43 p.m. Black knocked over the mic stand and is now BREAKING IT DOWN on stage. This is not the piano remix we started with. 11:35 p.m. Doing the Line Dance is fun, but watching Urban Dance Troupe dance on stage is fun too. The group takes the stage now to perform. 11:29 p.m. Dancer Relations captains, to the STAGE!!! 11:28 p.m. There is apparently a “really fun event” called The Playground happening in the South Annex in five minutes. We’ll have to take your word for it, THON captains. 11:21 p.m. 3AM Tokyo leaves the stage with a powerful “We Are” cheer. The speakers have been taken over by “All Star” by Smash Mouth. 11:10 p.m. Update: They’re singing (rapping) again. Whatever it is, it’s exciting. 11:08 p.m. 3AM Tokyo is still on stage and has the crowd jumping to some EDM mashups. I don’t think they’ve said anything other than “get your hands up” and something that sounds like either “PSU” or “chicken suit” in at least 10 minutes. 11:06 p.m. Surely you won’t be surprised to find out that even during THON, Penn State fans hate Mark Emmert and the NCAA. 10:59 p.m. Alumni love THON just as much (if not more) than students. Here’s a list of alumni THON watch parties around the country. If your alumni association chapter is watching shoot us a message or leave a comment and we’ll add you to the list! 10:53 p.m. You’re probably starting to get thirsty…but so is everyone else. With lines for the water fountains so long, we researched some other ways to get water once you’re inside the BJC. 10:46 p.m. The mics are back in good order, and 3AM Tokyo has moved into some throwbacks, and some psuedo-throwbacks (i.e. “Use Somebody” by Kings of Leon). 1o:29 p.m. It’s time for the second band of the weekend. 3AM Tokyo takes the stage, kicking off its setlist with a high-energy mashup of EDM and pop songs. It’s an especially high energy band, considering the singer’s microphone isn’t working. Fortunately things can only get more fun from here! 10:20 p.m. We got a chance to talk to line dance leader Gina DeFrancesco about the line dance, her favorite moves, and why she THONs. 10:16 p.m. Now that we’ve all settled into the Bryce Jordan Center, we’re excited to present a definitive map of where you can find your organization. Disclaimer: We are not responsible for emergency moves and indistinct letters. 10:14 p.m. PNC is creating a custom THON mosaic with pictures it is taking on the concourse right now. The piece will be revealed at midnight on Saturday. 10:09 p.m. If we get MisterWives 90 minutes into THON weekend, things are only looking up. 9:59 p.m. Ah, what a song can do to the BJC. This time it’s “Sugar, We’re Going Down” by Fall Out Boy to get the people energized. 9:55 p.m. Coach James Franklin takes the stage, accompanied by dancers and footballers Charlie Shuman and Nick Scott. 9:51 p.m. It’s SPACE hour…whatever that means. 9:47 p.m. It is fabled that nineteenth-century French writer Honoré de Balzac would consume 50 cups of coffee each day. We’re going to drink one every hour for the next 46. What could possibly go wrong? 9:44 p.m. You’re probably starting to get hungry. Here’s what’s available for dinner around the BJC (and where). 9:43 p.m. Hit the stage, Dancer Relation captains! Line dance time! 9:38 p.m. Bucci got us thinking — who are some other big time personalities who have thrown up their diamonds(whether intentionally or inadvertently)? 9:37 p.m. Zac Brown Band’ “Chicken Fried” is playing over the speakers and the crowd is vibing. Perhaps we can’t have a cold beer on this Friday night, but that’s okay. 9:34 p.m. To take a quick side-step from THON coverage, we hate to bring you the news that Penn State Men’s Hockey dropped its game against Michigan State in East Lansing this evening. 9:25 p.m. It turns out TETRA is just one, big, ever-changing anagram over in section 105. 9:20 p.m. THON’s Entertainment committee distributed light sticks with neon lights to add a little extra pizzaz to the crowd during MisterWives performance. 9:17 p.m. Unfortunately Joe Jonas hasn’t made a repeat appearance at THON (yet), Fratoni is playing the Jonas Brother’s “Burnin’ Up,” minus the Big Rob verse. However he did give a shoutout to Chris Chavez. Hi Chris. 9:05 p.m. There are thousands of people in the Bryce Jordan Center this weekend, but unfortunately hundreds of thousands more who can’t make it to Happy Valley this year. If you fall into the later category, we want to know where you’re following THON 2018 from. 9:00 p.m. We all love playing HQ Trivia, but push notifications to dancers’ phones may accidentally reveal the time for dancers who didn’t think to turn them off. 8:56 p.m. Getting a little lost around the BJC? We put together a portal guide to help you find your floor entrance, favorite snacks, and more. 8:54 p.m. The menu has changed already…? Dancers 1-50 got BBQ but dancers 51-the rest get lasagna, baked ziti, breadsticks, and a garden salad. 8:50 p.m. It appears the NCAA is prohibiting players from participating in the THON Explorers program, the tour of the Lasch Building, or any media availability this weekend because of time management restrictions. 8:49 p.m. It’s time for the “7th Inning Stretch with Gina.” Though we are nowhere near the “7th Inning” portion of the weekend, the stretching is certainly welcome. 8:46 p.m. Happy birthday to all those celebrating with a giant party this weekend! A list of names just scrolled across the big screens of those who get to share their special day with THON. 8:36 p.m. We tried out the Creamery’s THON-themed Gold Ribbon Ripple and have to say, we’re quite impressed. 8:34 p.m. Dancer Relation captains take the stage!! 8:28 p.m. Hospitality is now serving dancers their first meal: Pulled pork sandwiches, mac ‘n cheese, veggies and dip, brownies, and cookies. Sounds like a great meal (if you don’t have to stand for another 44 hours). 8:24 p.m. The hyped-up crowd is jiving along to a “Castle On The Hill” remix. The Entertainment DJs are on their game, and it’s going to be a fun weekend. 8:19 p.m. The Lion joined MisterWives on stage to close out their set. The performance has energized the BJC like no other. 8:04 p.m. This isn’t MisterWives first trip to Happy Valley — the Indie rock group performed at Movin’ On 2016. 8:01 p.m. MisterWives plays their set with one we all know a little better: “Reflections.” The crowd is singing along now! 7:59 p.m. We interrupt this surprise MisterWives performance to bring you a video of the line dance. Get practicing! 7:52 p.m. As we predicted last year, Joe Jonas and DNCE’s surprise performance at THON 2017 did in fact create a precedent for THON to bring a big name, surprise act to perform. 7:47 p.m. Much of the crowd doesn’t seem to familiar with the two songs MisterWives has played so far, including “Machine,” the first song on the band’s most recent album. 7:28 p.m. DANCER RELATION CAPTAINS, TO THE STAGE. 7:17 p.m. So now you know the line dance, but do you know what it means? Check out our “Genius Lyrics” analysis of the line dance if you’re still wondering what some of the references are. 7:12 p.m. Entertainment is on stage setting up for the first act. 7:03 p.m. Hopefully you all paid attention — it’s time to do the line dance in full. Dancer relations captains, TO THE STAGE! 6:56 p.m. Stiiiiill learning the line dance. 6:32 p.m. The weekend is young, but surely some of us are already craving ice cream. May we suggest the Creamery’s new flavor Gold Ribbon Ripple? 6:30 p.m. Now it’s time to learn the line dance. Four Dancer Relations captains are on stage leading the crowd through the lyrics and dance moves for the first time. 6:26 p.m. Here they are: the THON 2018 Line Dance lyrics! 6:24 p.m. DANCE RELATIONS CAPTAINS, TO THE STAGE! It’s time to hear the 2018 Line Dance for the first time! 6:18 p.m. The Berkey Creamery announced it has created a new flavor to commemorate THON and its efforts over the past 46 years. The flavor, named “Gold Ribbon Ripple,” will have gold caramel ribbons throughout it to symbolize the gold ribbon synonymous with the fight against pediatric cancer. Spectators can try a sample of this flavor at Gate B throughout THON weekend, and a portion of all proceeds at the Creamery will go toward THON. 6:10 p.m. General spectators — including family and friends of dancers — are finally being allowed inside the Bryce Jordan Center. Of course, however, they missed the first few minutes and dancers standing. 6:05 p.m. The third song of THON 2018 is “September” by Earth Wind and Fire. It might not be the 21st night of any month, let along September, but everyone in the BJC is dancing the night away. 6:00 p.m. 3….2….1…. DANCERS STAND!!!!! THON 2018 is underway! 5:59.50 p.m. Start the countdown! 10, 9, 8…. 5:58 p.m. Executive Director Andrew Smith takes the stage to introduce the Executive Committee. 5:56 p.m. Vocal Penn State hockey (and THON) supporter John Buccigross Tweeted his support of THON. We wish you were here too, Bucci. 5:52 p.m. A “Journey to THON” video takes over the big screens, highlighting the events and activities that lead up to THON weekend. Featured snippets include the Family Carnival, theme reveal, the THON 5k, and videos of THON children. 5:48 p.m. Just kidding, Reve Dance Company is back on stage to actually give their performance. 5:47 p.m. With less than 15 minutes until dancers stand, the line for general spectators to get into the BJC wraps all the way around the west side of Beaver Stadium (yes you read that right) and no general spectators are being let in yet. It appears THON gave preference to organizations that had set times to enter. 5:44 p.m. The last act of the THON Kick-Off show is the Penn State Blue Band drumline. Get hype, folks. 5:39 p.m. Now for a little hype from Club Cheerleading. Dancers stand in 21 minutes!! 5:36 p.m. Addison Lindberg, a Supply Logistics captain, is singing “Valerie,” by Amy Winehouse. 5:32 p.m. Reve Dance Company is the next act in the THON Kick-Off show. It appears there is a music malfunction, as the dance group just stood in their opening formation staring at the ground for the entirety of their on-stage allocation. Sandy Barbour, James Franklin, and and a VERY enthusiastic Pat Chambers just pumped up the crowd with a welcome video. 5:20 p.m. It’s time for the THON 2018 kick-off show! The first performance is by Victoria Fitzgerald, who is singing the National Anthem. 5:17 p.m. A performer is singing “God Bless America,” prompting the dancers (and everyone else in the building) to stand. Not yet guys! 5:08 p.m. Kyle McGarry takes the stage to explain the safety procedures for THON weekend, including things like unprecedented emergency evacuations. 4:56 p.m. Tom Fountaine, State College Borough Manager, takes the stage with his wife to introduce State College Borough Mayor Don (THON) Hahn. Hahn is reading the special proclamation the Borough Council signed renaming State College the City of THON from 6 p.m. Friday until 4 p.m. Sunday. 4:41 p.m. The dancers are now all inside the Bryce Jordan Center and starting to disperse themselves around the floor. Almost all are sitting an many are stretching and chatting. 4:19 p.m. The dancers are officially entering the Bryce Jordan Center through the human tunnel! OPP, R&R, and Dancer Relations Committee Members line the way for the 707 that will soon stand for 46 consecutive hours. 4:00 p.m. Spectators and organizations are beginning to file into their chosen sections. Thanks to THON’s line protocol, things are moving far more smoothly than they have in past years and there wasn’t really a mad dash or fight between orgs to get a section (yet). 3:34 p.m. Spectators and committee members surround the BJC as they prepare to enter for THON 2018. Check out this aerial from the outside. 1:00 p.m. Mission accomplished — we’re inside the BJC and ready for THON 2018. Entertainment and OPP are putting the finishing touches on set up and running different sound and video checks.